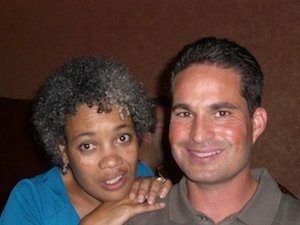 Then Mayor Elect Marie Gilmore with Alameda firefighters union president Jeff DelBono on election night, 2010, at Otaez restaurant. 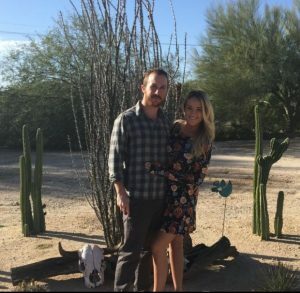 In an astounding display of elitism, and with great insult to the nationwide movement to institute a $15/hour minimum wage, Alameda firefighters union president and fire captain Jeff DelBono took to the local Alameda blogs to try to argue that $43/hour is a “working families” wage. 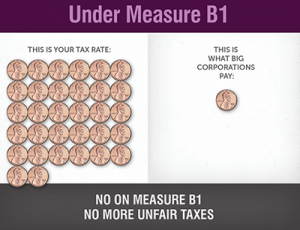 Corporate out-of-town landlords, business parks, big box stores pay a lower tax rate with Measure B1 than residents and small business owners. This is the mailer that many Alameda residents received in their mailboxes on Friday, October 21. The local rental housing market is cooling off, betraying the folly of permanent, severe, rent control restrictions as a response to short-term market moves. 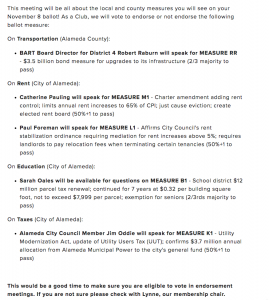 Alameda’s Measure K1 expands the utility tax to cover Netflix. In an obscene tax grab, the City of Alameda, with Measure K1, is expanding its so-called “utility” tax to cover popular services that are hardly “utilities” – streaming video services like Netflix and Amazon Prime. With Measure K1, you will end up paying more for every mobile phone in your family – including your children’s phones. 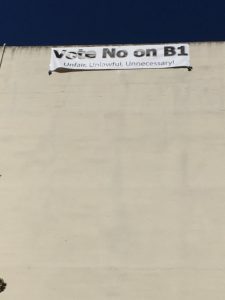 No on B1 banner on Oak Street building. No on B1 banner on Oak Street building. [/caption]The wind finally tamed, the No on B1 banner flies high on an Oak Street, Alameda building. As the person who originated the concept of square footage taxation in 1980, I am writing to urge voters to oppose the Alameda Unified School District’s Measure B1 on the November ballot. Measure B1 violates state law, funds some students and schools but not others, and is unnecessary because the current parcel tax doesn’t expire for another 2 years. The Green Party of Alameda County has endorsed Jennifer Roloff for city council. The Green Party of Alameda County has endorsed Jennifer Roloff as candidate for Alameda City Council. 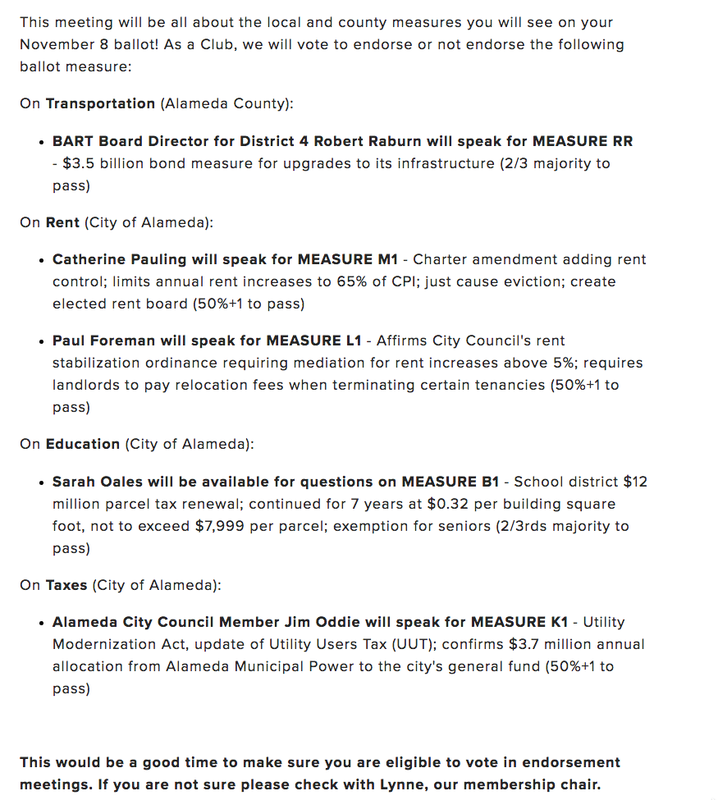 Tomorrow night’s City of Alameda Denocratic Club forum will discuss the utility tax measure, the rent control measures and the school parcel tax measure, but only from one side. Opponents of these measures were not invited to speak. The move represents a new low in Alameda machine politics as the controlling inner ring has abandoned even the pretense of civil discussion over the issues. The City of Alameda Democratic Club has abandoned all pretense of civil discourse over local issues.